Fig. 6. 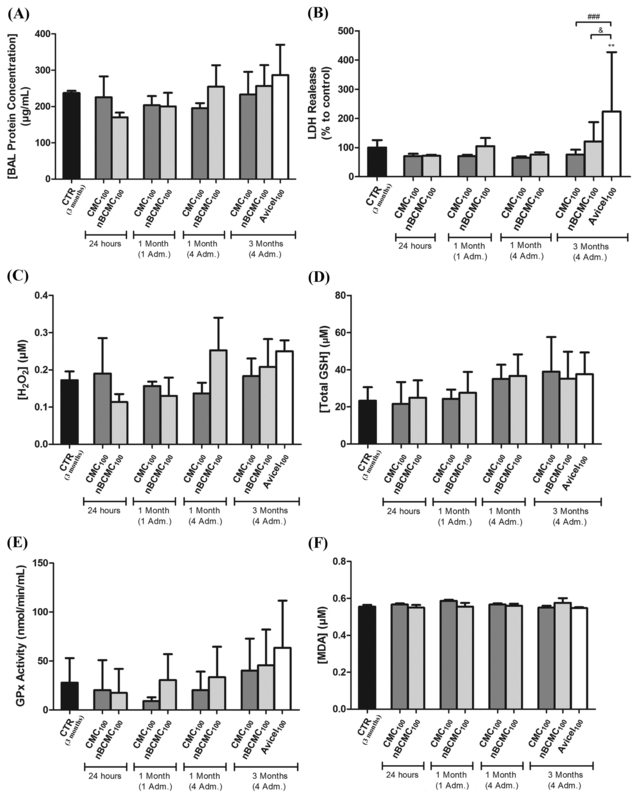 Assessment of lung damage and oxidative stress responses in BAL fluid of C57BL/6 mice intratracheally instilled with CMC100, nBCMC100 and Avicel100 over time. (A) air-blood barrier damage was evaluated by total protein quantification, **p<0.01, ###p < 0.001 and &p < 0.05 comparing Avicel100 (3 months, 4 adm.) with control and with CMC100 (3 months, 4 adm.) and nBCMC100 (3 months, 4 adm.), respectively. The quantification was performed by using calibration curves obtained with the appropriate standards. (B) lung cellular damage was evaluated by LDH release quantification and oxidative stress was measured as (C) H2O2, (D) total GSH, (E) GPx activity and (F) MDA quantification. Bars correspond to means ± SD (n = 3 or 5 mice per group).